Mahakulung, an ancient Kulung territory located close to the southern slopes of Everest, the highest mountain in the world, is known as Lower Everest to the western trekkers. 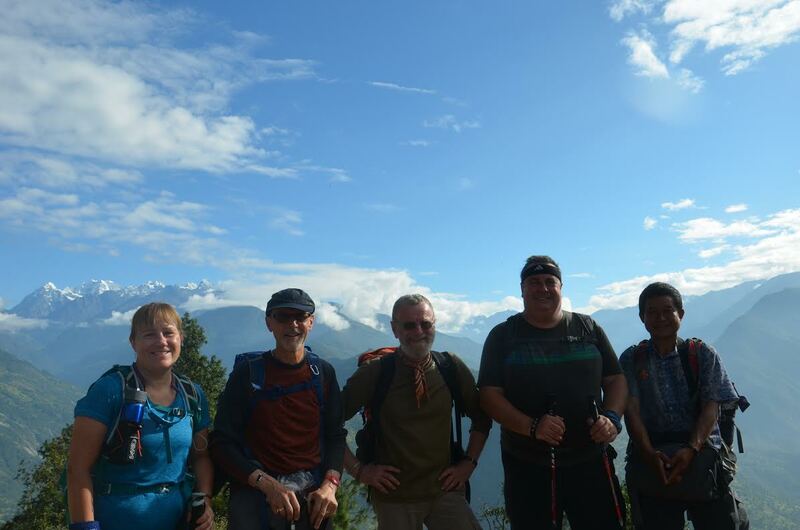 Fourteen years ago, while doing his porter job in the Everest region, a school boy called Dilip S. Kulung met Mr. Michael Fuechsle, teacher (now retired) from Germany. 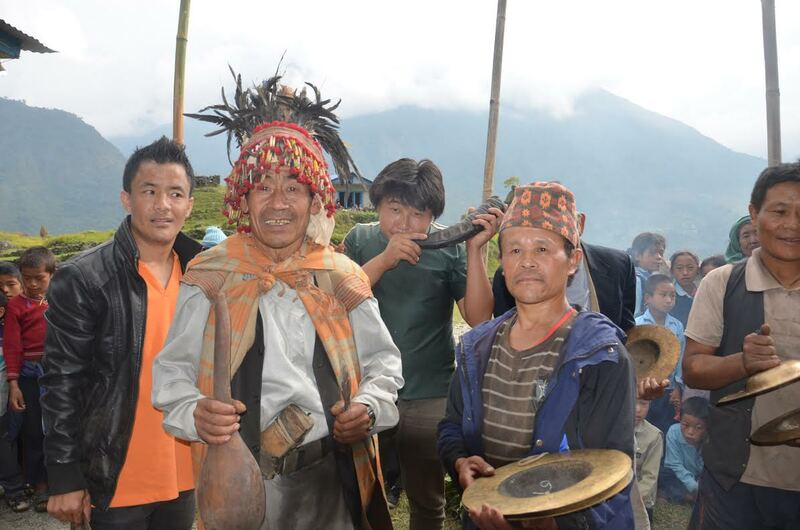 Mr. Michael has been investing his effort to support the Mahakulung people since the 2015 earthquake. 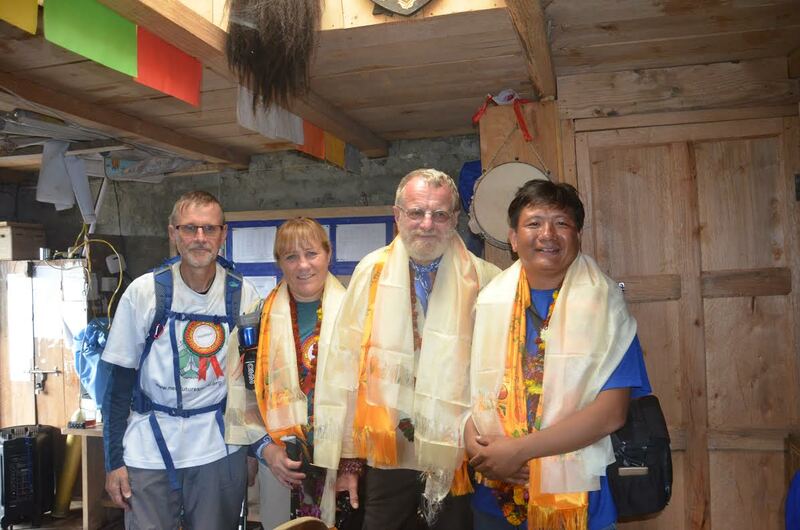 In last October, Mr. Michael made his first ever visit to Chheskam with 3 more respected trustees; Mrs. Helen Crook, Mr. Paul Crook & Mr. Charles Barton from the UK. “15-Hour Jeep Ride from Hell“ and “Unpaved Road to Nirvana” are two reports about the trip from KTM to Salleri to be found in the Internet. 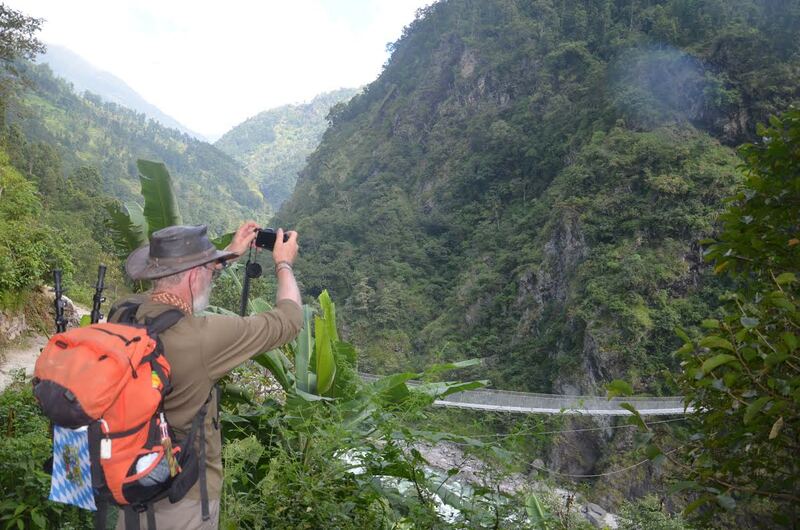 Fortunately, when we left KTM at about 6 in the morning on Oct.11, we had no idea of what was lying ahead of us. The last monsoon clouds gave way for a short glimpse of the snow-clad mountains, before we engaged on the road following the Sun-Koshi River. We were making good progress on the partly newly tarmacked road, until the winding roads were increasingly blocked by small landslides, the tarmac was gone, yet our attention was centred on the beautiful scenery each new bend offered. But then the “turning-point”: two bikers told us the road ahead was unpassable – which meant we had to fall back on our track for two hours and go south towards the Indian border in a long loop. The rain had left its traces: roads flooded and partly swept away, mudslides and blocks of all sizes on and along the road. When we finally stopped at around 21h, we were shocked to hear it was “only about 100 to 120km more” to go! Glad we couldn’t make out the abyss on the left or right and all the other obstacles we passed in the darkness, we fell into a kind of half-sleep, half nightmare, and we could only just admire the unrelenting stamina, caution and surety of our driver who, when we woke up from our stupor, had safely taken us to our lodge in Salleri after 20(!) hours of driving! Having seen the devastating effects the 2015 earthquake had left not only in Kathmandu, but still more so in some rural parts of the country, many people in Germany and all over the world felt urged to contribute their share to help. Dilip was among those who directly organised a campaign immediately after the disaster by purchasing 3000 tents and tarpaulins for the people affected in Chheskam and two other communities of the Mahakulung region. To support his efforts some of his friends abroad collected and sent money, and my friends and I were happy to contribute our share. During my visit in October I was astounded to see how successful the local residents have been in their reconstruction work: in stark contrast to Kathmandu, nearly all the houses and most schools have been restored or newly built with infinite skill and hard labour. As a former secondary-school teacher with 40 years of experience, I know how important it is for teachers to motivate the students’ work with interesting material. But I also know how needy the schools in Nepal are with respect to basic equipment. It was therefore a natural idea to provide the schools in Chheskam with some desperately needed stuff to support teachers and students in their daily work, but also give them the chance to relax and entertain themselves with sports equipment and some games. What our porters took there in October can only just be a beginning – more material will always be welcome! After our long jeep ride to Salleri, we were happy to finally “foot it” to Chheskam – but then we found out that it was harder than we had thought: the paths turned out to be a never-ending series of steps of various height so that we were forced to carefully watch every single step we made, certainly not an experience for the common European ‘Nordic-Walker’! But the ups and downs also gave us many occasions to catch our breath and look around to admire the fantastic scenery: fairy-tale forests alternating with lush fields of rice, millet and corn in their rich autumn colours interspersed with the white and blue of the newly-restored houses and the snow-clad mountains in the background– what a spectacle, when the rain finally ceased and the sun made the landscape shine like a splendid painting! To the common European traveller the settlements come as a kind of surprise: they are hard to ‘see’ as villages, as the farms and sheds are not built closely around each other, but are widely dispersed across the fields and terraces piling up for hundreds of metres of altitude – what an incredible challenge for the farmers tilling the soil, ploughing and sowing and harvesting the produce in these little patches without any of the machinery that we know! And yet: wherever you go, you are always greeted with a friendly “Namaste” be it by elderly farmers with a huge load on their backs or young children hardly able to walk on their own – and they all seem to be smiling all the time: on a day’s hike you most certainly see more smiles than during a whole week here in Europe! 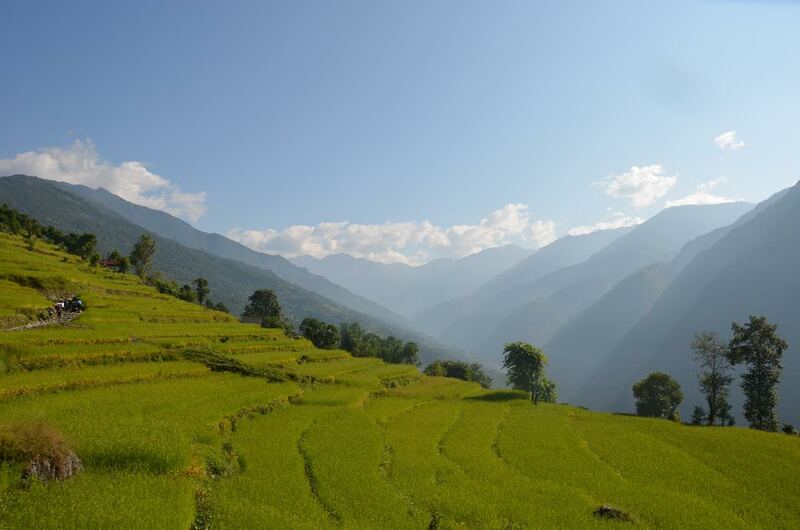 This alone makes it worth travelling to Nepal and the beautiful Mahakulung region!